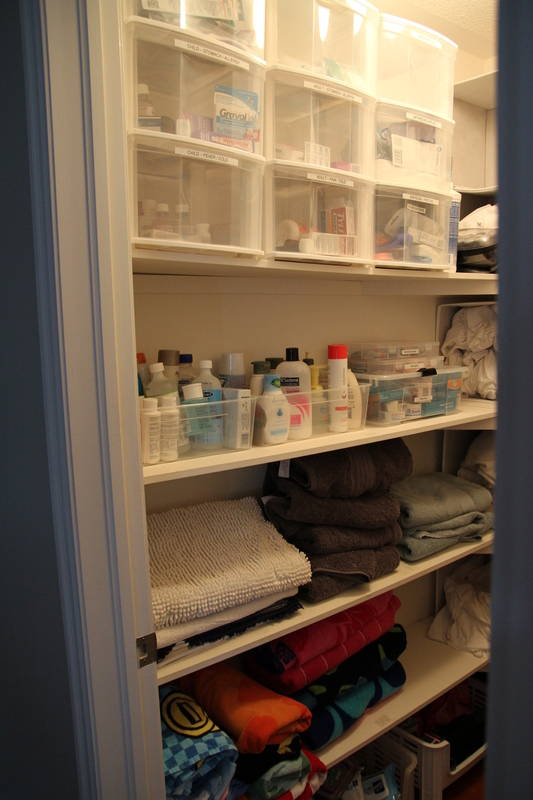 In my house, the medical “section” of my linen closet was out of control! 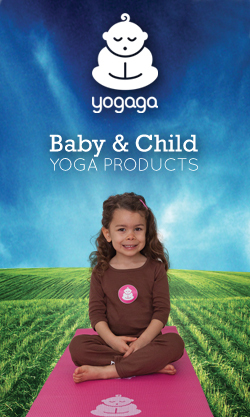 We couldn’t find anything when we needed it, and our kid stuff was completely mixed in with the adult medications. I found a quick and easy way to get things organized in a way that will surely KEEP things neat and tidy! – three 3-drawer plastic organizers from Home Depot ($9.97 each) – I actually saw these go on sale to $5.97 each a couple weeks later. 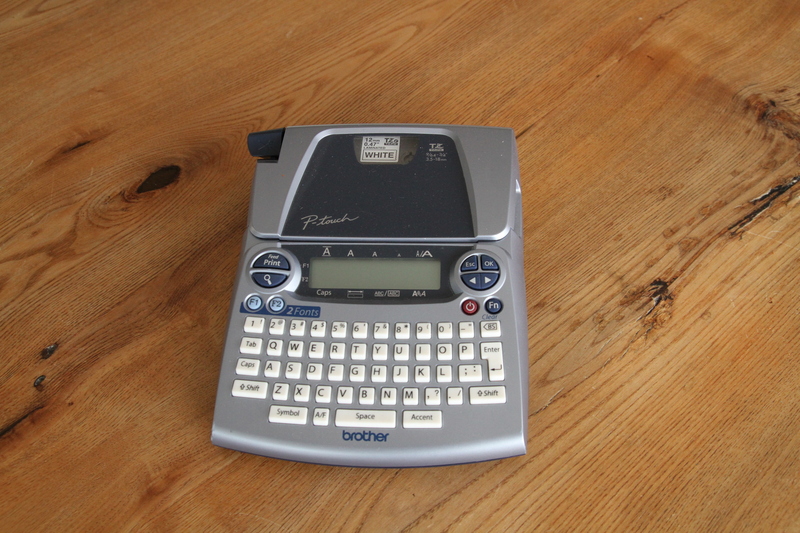 – label maker (which I had). 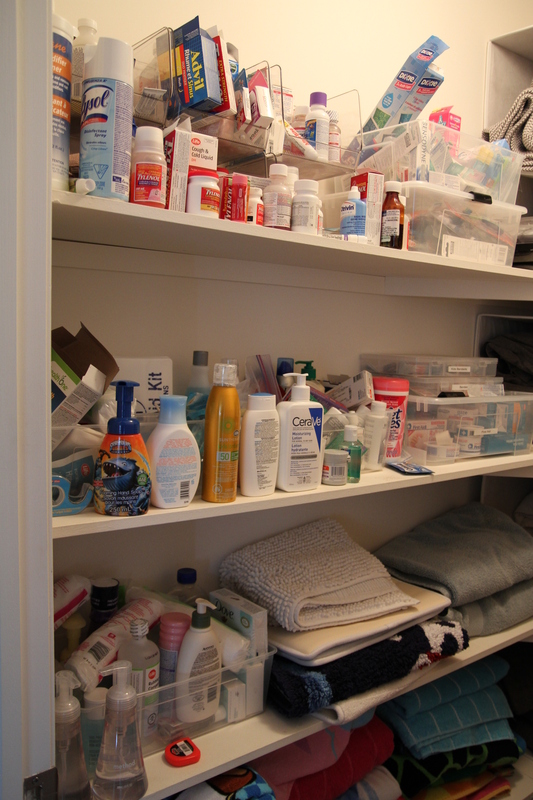 1) completely clean out all your medical supplies – sort through and make sure you toss everything that’s expired! (Pretty much half of my things were). 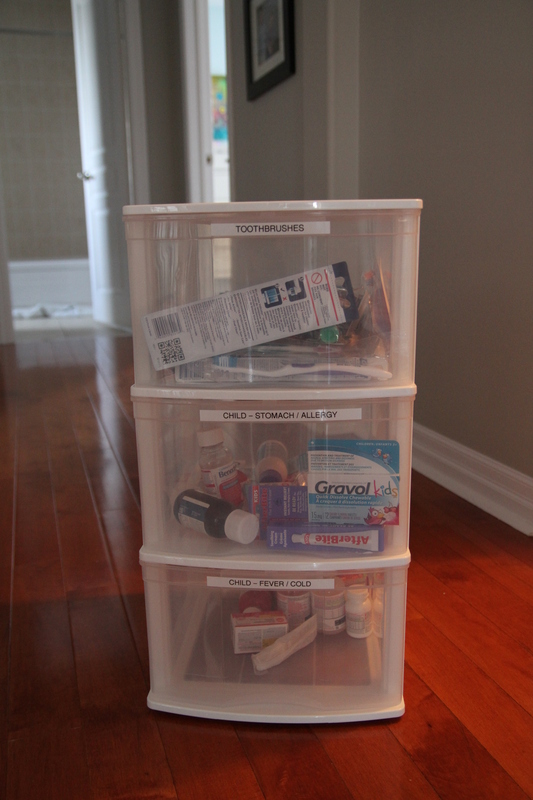 2) Sort all your supplies into desired groups and make labels for each drawer… I used: kid stomach/allergy, kid pain/cold, adult stomach/allergy, adult pain/cold, toothbrushes/floss, toothpaste, first aid, prescriptions, bathroom supplies. 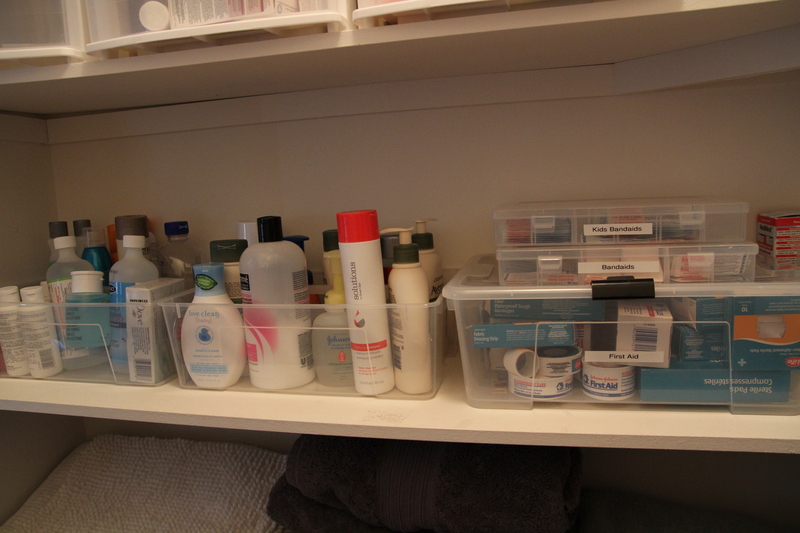 3) Fill your labeled drawers and stick back up on your shelf! I have high ceilings in my closet so I was able to stick the bins up high on the top shelf. If you don’t, you can always source out smaller drawer organizers or use other small plastic bins for organization. 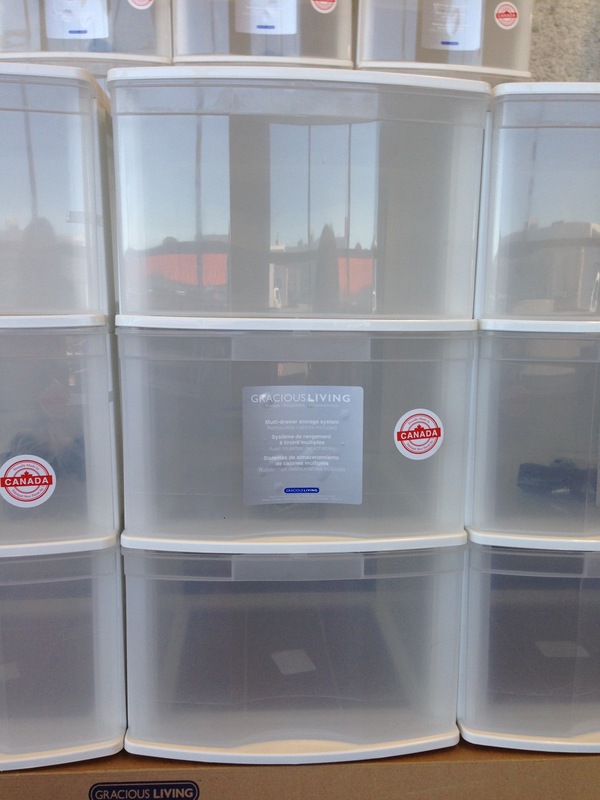 Canadian Tire has a great selection of inexpensive small plastic boxes. 4) I also had a couple ikea plastic caddies laying around. 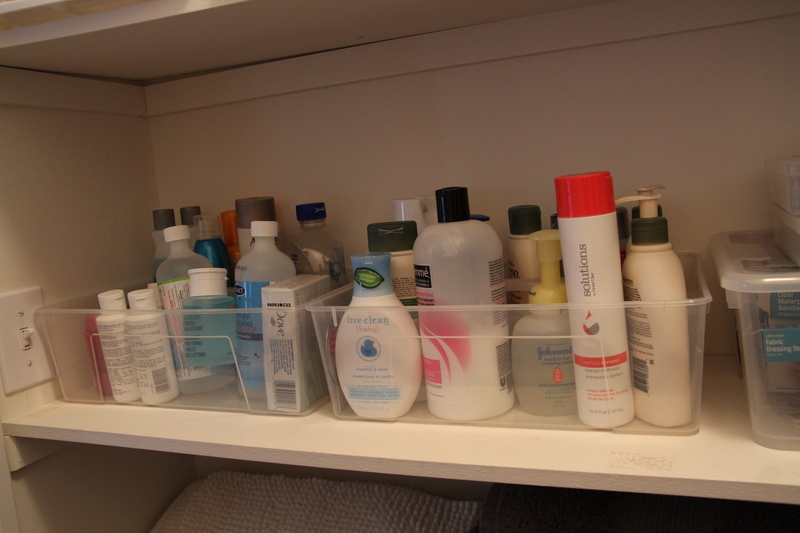 I used these to store my larger supplies like extra bottles of shampoo, rubbing alcohol, soaps etc. 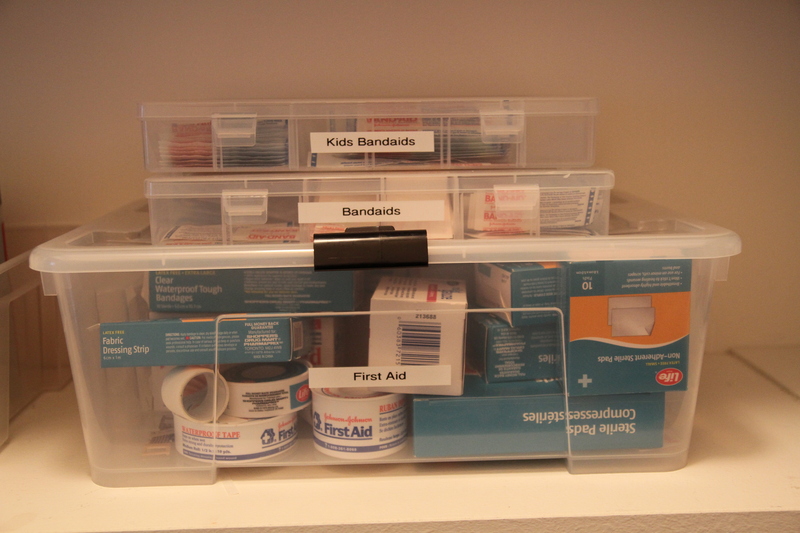 5) I separated and organized our massive bandaid collection into a kid and adult container (so I won’t end up with Dora or Spiderman when I go to grab a bandaid). These super handy organizers can be found anywhere… I had mine from a recent trip to Michaels (also found at Dollarama, Walmart and Canadian Tire). Great job!! I love the idea of using those 3-drawer plastic organizers.